Play Slingo Rainbow Riches: One of UK’s Top Slingo Games! 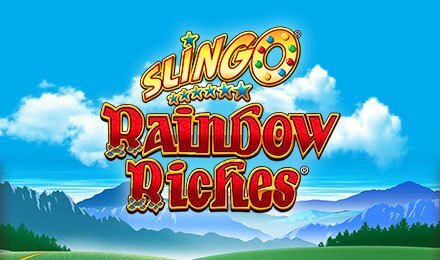 If you love playing Slingo games, then you must try out Slingo Rainbow Riches. This is magical mix of one of the most popular slots games ever and bingo. This is where the lucky Irish leprechaun meets the crazy Slingo Jokers to take you on a wild ride to the pot of gold at the end of the rainbow. This game is awash with the original features from the blockbuster Rainbow Riches to create a massively fast paced and exciting game. You get 9 bonus rounds, and the more Slingos you manage to get, the more bonuses you play! 1. Start the game by clicking on SPIN. 2. Cross the numbers that appear on the reel off the grid. Remember, you will have only 20 seconds to daub those numbers, so focus and be quick! Slingo Rainbow Riches combines the regular numbers with special symbols that help increase your potential to win. The Joker: If you land a Joker, then you get to daub any number on that column. The Super Joker: The Super Joker lets you daub a number anywhere on the grid. Coins: You get instant cash wins! The Devil! This wily bloke appears on the grid then you can lose up to 50% of your winnings. The Cherub: This little angel will double your wins. 1. The Wishing Well Bonus: If you get 5 Slingos in a row then you activate this bonus. You get to pick a multiplier. 2. The Cash Crop Bonus: Get 6 Slingos and you activate this bonus. There are 50 spinning coins on the screen that give you a chance to pick one. You get prizes and multipliers. another 3 prizes. If you reveal all 3 prizes and you still have 2 picks left, then your wins are trebled. If all 3 prizes are revealed and you have 1 pick left, then your wins are doubled. 4. Magic Toadstool Red Bonus: It’s like the Magic Toadstool bonus except that you get 4 picks instead of 3 and the wins are much higher! 5. Road to Riches Bonus: Get 9 Slingos and you can win up to 500x your base! 6. Road to Riches Red Bonus: Just the Road to Riches bonus, but double the wins! 7. Pots of Gold Bonus: If you manage to get a full house of Slingos, this massive bonus is activated. 12 pots spin in a circle (like a wheel of fortune) and the one that lands on the arrow at the bottom of the screen is your mega prize!